The last theater show I actually won was at the end of November. That’s not to say I had been completely shut out on the ticket center. After all, I did win a Request Hour show, and got a good seat as well. 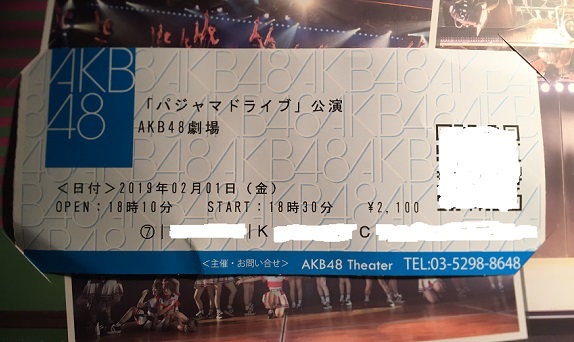 But for the last two months the best I have gotten for a theater show has been three really high cancel machi elections, and as a result didn’t win the show. However, in two of those I did win the opportunity to participate in the post-show “high wave,” which to me begs the question; Which is better? Winning the show, paying the admission, watching from a bad vantage point in the back, and greeting the members as I leave? Or, paying nothing, watching the show on the monitors (and even leaving for a while to grab some food), and then entering the theater after the show to greet the members. So to me the latter is almost as good as the former, although winning the show and having a good seat is another matter entirely. It had already been an eventful day. I spent my morning taking a Japanese exam, after which I hurried to Ginza to attend Wasamin’s 24th birthday party, which you can read about on my previous post. After the Wasamin event I had around three hours to kill before I had to get to the Donki for the cancel machi call, so I had a light lunch at Choco Cro, and then moved over to Akihabara for a few pre-show cocktails at The Hub. I had a couple of double-Whisky/rocks, so I was in a really good mood by the time 6 p.m. rolled around. By 5:30 the cancellations had gone past 40, so I was confident enough about my chances that I stored my backpack and jacket in a locker. However, it looked like my confidence may have been a bit premature, since when they began calling cancel machi numbers it seemed like everyone was there, with very few no-shows. Ultimately the initial call ended at #63. I thought to myself that I might not get in after all. In the meantime a young fan walked in who had won the show, and was arguing with the staff that he wanted a ticket for the seat lottery, and didn’t want to be in the ‘final group.’ But they had already filled the tickets, so he was out of luck. This also meant one less spot in the final group, so my chances became slightly lower. They started the second call, and as it got closer to my number there were a lot of no-shows. Eventually I heard #84 called, and I was in. Score-a-rooni! In fact I was the second to last person, as they cut it off at #85. In the meantime, the kid who was pissed off that he wasn’t in the seat lottery just left, which was a really dickish thing to do since it ultimately meant that he screwed over a cancel machi holder who would have gotten in had the dude just bailed from the beginning. However, they ultimately let two more people in who won the show and arrived late. So this would be my 49th theater show. Since I entered the theater 4th to last I knew any vantage point I would have would be mediocre at best. I made my way to the far right of the standing area since I often find a decent view from the corner, but even that area was packed. Eventually two people left the area, I guess to find a better spot, so I was able to maneuver my way to a slightly better view where I could see the middle of the stage, and an obstructed view of the right side. Once the show started I came to realize that the people in the elevated back-right corner were extremely rambunctious, so this was going to be a wild show. Otake Hitomi (Hitomin) and Honda Sora (Sorachan) To me they are two of the most talented of the 3rd gen draftees, not to mention they come across as the most mature and adult-like, at least on stage. Sorachan had a huge following in the audience, and the cheers for her were quite intense whenever she talked, or sang a solo line. Hitomin is a great dancer, and her eyes are hypnotic. Katsumata Saori Was a last-minute addition to Friday night’s cast. Ya know it’s too bad that she was just a little late in attempting to fish me, as she very well could’ve become my favorite draftee. I do enjoy watching her perform, and she always gives me a cheery greeting. However, I have never taken the time to really talk to her. I probably should though. I wonder how good her English is? Ishiwata Sena (Senatan) She is so adorable, it is hard to take your eyes off of her. I can’t believe she is older than Ran-chan. There are certain girls, Saito Haruna is another one (not to mention Satomina, who wasn’t in this cast), who just captivate people with their “baby-girl” cuteness. Tada Kyoka is the group comedian. Her reactions are always priceless. She is cut from the same cloth as members like Chori, Annya, and Noeppi. Granted, this does not often translate into huge success within AKB, but she seems to have the talent to become a great variety idol. Okada Rina At fit I didn’t like her at all, but her aloofness and dry wit has become more endearing to me the more I watch her. She almost comes across as a Shinoda Mariko, or Matsuoka Natsumi type. But I will say that she is good at controlling a conversation, and running an MC. Her performance in Jean de Arc (she replaced Zunchan in center position) is really good too. Sato Shiori is another member who is just naturally goofy, and I like unorthodox idols. She has warmed up to me as of late too. So yeah, I am a fan of quite a few of the current trainees. The show went well, and the back right portion of the audience was intense from start to finish. Oddly enough, three of the fans in our area left in the middle of the show, and never returned. That freed up a little space, except the two guys in front of me kept slowly shifting backwards, until one point I had to tap one of them as they were literally pushing be against the back railing, and had like two feet of space in front of them. I had half a mind to push in front of them, but I figured that wouldn’t have gone well. As for ‘High Touch,’ I got the usual reactions from the usual members (Sorachan, Hitomin, Saori, Shiori, Kyoka) and got a surprisingly bright ‘English reaction from Kuramoto Miyuu. But Ran-chan of course got really excited, and continued to follow me and wave even when i was two members past her. Definitely a Kami-reaction. After that I left the theater, purchased my usual show commemorative photoset with folder, grabbed by stuff, and bailed. It was probably the cleanest performance of Pajama Drive I have seen these members do, and I look forward to seeing them perform it again soon…hopefully.